Thanks to innumerable delays, the fabled white iPhone has almost attained mythical status. However, the wait might finally be over. Earlier in the week, we had spotted an white iPhone 4 running a test build of iOS. 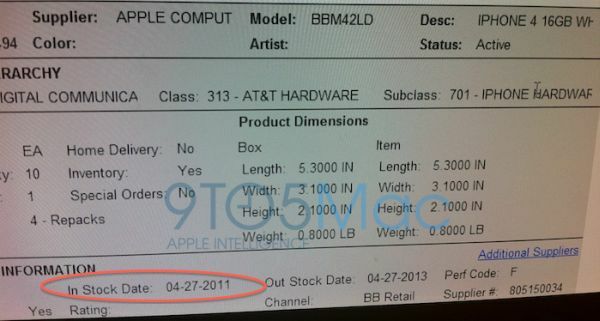 Now, 9to5Mac has obtained the inventory list of BestBuy, which lists April 27 as the launch date for the white iPhone 4. 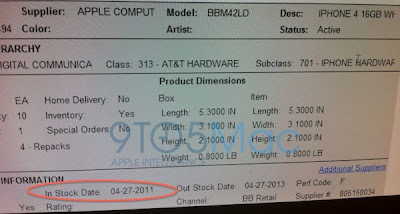 Earlier, iPhoneItalia had claimed that the much awaited variant of the original iPhone 4 will be launched on April 26, while 9to5Mac had confirmed April 27 as the launch date in Netherlands. In fact, one customer has already managed to snag a white iPhone, thanks to a goof-up by Vodafone UK staff. In a statement to WSJ, Apple had confirmed that the white iPhone will be launched this spring. However, the sudden flood of information suggests that retailers around the world have already started receiving shipments of the highly anticipated handset. We would normally be cautious about getting too excited based on unconfirmed reports. However, the multitude of independent confirmations makes it likely that the white iPhone will indeed be launched next week. The pristine beauty of the white variant caught the attention of many a people around the world when it was first unveiled. However, the big question is, how potential buyers have already opted for the black edition? Apple repeatedly delayed the white iPhone 4, and failed to provide a concrete release date, or a satisfactory explanation for the delay. With iPhone 5 release being around the corner, many users might opt to wait it out.